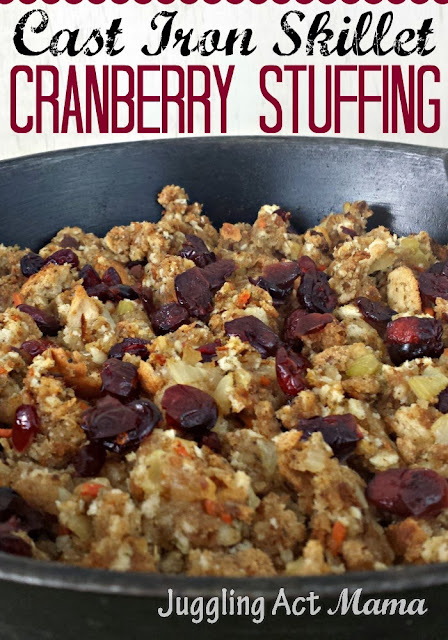 Make this Cranberry Stuffing in your Cast Iron Skillet for easy one pan cooking. You’ll love this flavorful side! Growing up, I never ate stuffing. I just never cared for the mushy mess and never understood the point. As my youngest sister notes, “I like bread in it’s original form just fine.” And to that, I must agree. A stuffing done just right really is pretty awesome – all those yummy flavors coming together in one dish. My mother makes incredible stuffing and often more than one variety for Thanksgiving so she can please both those who like it soft and those who like it crunchy. She’s been known to make a special dish just for my father, who loves nuts, because the rest of us aren’t crazy about them. She’s pretty incredible. Back to the stuffing, this short-cut recipe uses a store-bought base (you have enough to do, why reinvent the wheel??). It’s prepped, baked and served in the same pan and there’s minimal clean up – gotta love that! Be sure to print this cranberry stuffing out so you’ll have it on hand! Melt the butter over medium heat in your cast iron skillet. Add the onion, celery and carrots and cook until the vegetables are tender. Remove the pan from the heat and stir in the broth, cranberries and stuffing mix until combined. Cover with tinfoil and bake at 350-degrees for 15 minutes. Remove the tinfoil and bake for another 15 minutes. I hope you enjoy this delicious dish, and be sure to check out more of my recipes. Follow Juggling Act Mama – Ang Paris’s board Juggling Food on Pinterest.